The first workshop on the development of the national laboratory strategic plan for Uzbekistan was held in Samarkand on 1–3 August 2016. All 35 members of the multisectoral national laboratory working group (NLWG) came together to develop the draft plan. This follows the development earlier this year of the National Laboratory Policy, for which the NLWG will seek endorsement from the Ministry of Health following a planned policy consultation. Since 2013, Uzbekistan has been involved in the improvement of its diagnostic and public health laboratory systems under the Better Labs for Better Health initiative, coordinated by the WHO Regional Office for Europe. 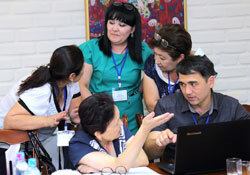 The current NLWG in Uzbekistan is represented by the public health sector (including radiology, chemical, environment, virology, microbiology, HIV and tuberculosis laboratories), and laboratories from the clinical and diagnostic, private and agricultural sectors, as well as at points of entry. Representatives of academic institutions and medical colleges are also members of the NLWG, and they are actively involved in training curricula review and capacity improvement for training laboratories, which are core components of the Better Labs for Better Health initiative. Members of the NLWG highly appreciate the opportunity to meet and discuss the important issues in this field that are of relevance for Uzbekistan. The workshop was enhanced by discussion on the International Health Regulations (IHR) (2005). Tutoring and performance of a case study on the subject provided a clear vision of the importance of laboratory capacity strengthening for IHR compliance. This work is supported by the European Union (European Commission's Directorate-General for International Cooperation and Development) as part of the project on strengthening health laboratories to minimize potential biological risks (contract IFS/2013/332312).